For Charmaine, the steps to a record deal with the worship label David Smallbone founded in 2001 were almost invisible, though in hindsight she can see Gods provision in each one. Shes one of the few artists who didnt go out searching for a record deal. 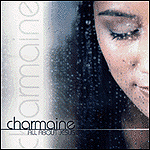 Two years ago at Gospel Music Week in Nashville, meetings between Smallbone and Charmaines father about expanding Endless Praises music ministry expanded into talks about Charmaine and her talent. Shortly after hearing and meeting Charmaine, Smallbone offered her a record deal with Elevate.